Distinctive features: The same as the AC only ANITA 1011 LSI but is a hybrid with an additional compartment at the rear with rechargeable batteries so that it can be used independently of the AC supply. 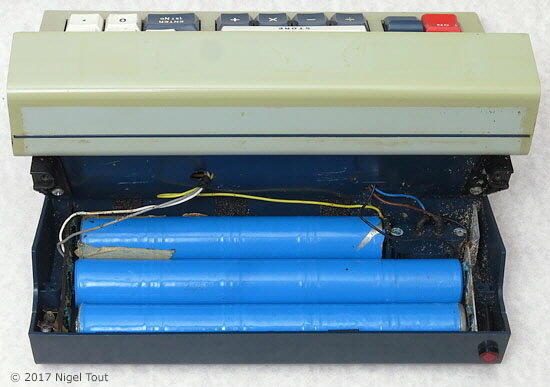 One example of this calculator, illustrated below, has been modified by having the batteries removed and replaced by a capacitor for AC operation only. Power supply - AC and rechargeable batteries (14x NiCad cells). 222 mm X 163 mm X 88 mm (9" x 6.5" x 3.5"). Made in England by Sumlock Anita Electronics Ltd., distributed by Sumlock Comptometer Ltd. It has a leatherette-covered, wooden, fitted case. Significance: A portable electronic calculator with rechargeable batteries and built-in AC adaptor / charger derived from a purely AC model. 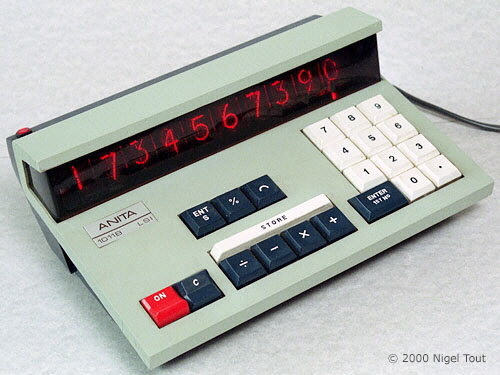 This was the first electronic calculator of Sumlock Anita Electronics capable of battery operation. 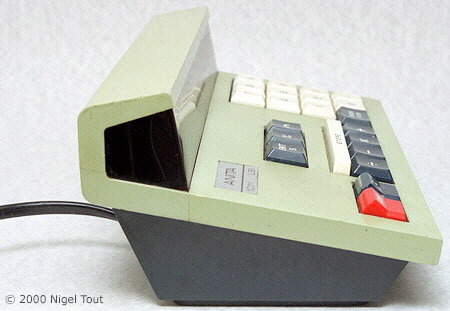 The introduction of the first hand-held model of the company was delayed because the managing director of the company could not see a market for it. 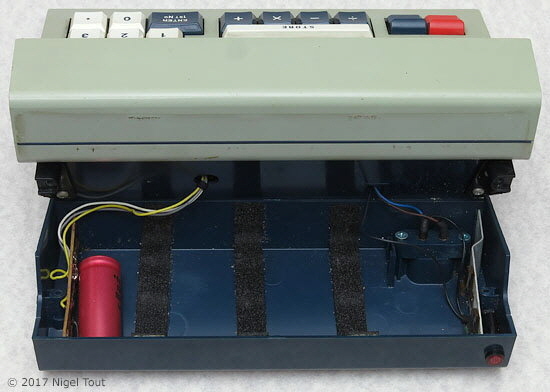 The photograph above shows the bulge for the rechargeable cells on the back of the 1011B LSI. 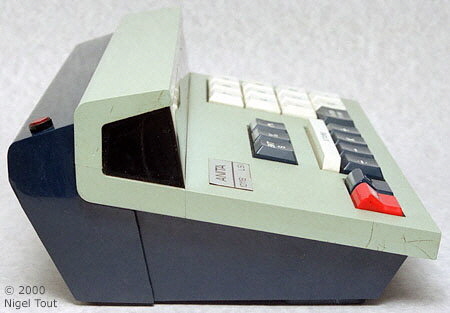 Compare with the photograph below of the AC only model 1011 LSI. 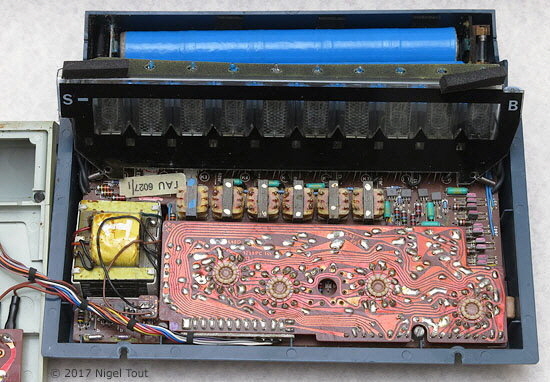 Here the battery compartment at the rear has been removed and lowered down to reveal the 14 NiCad cells in three modules. The cells appear to be a special size; each is 35mm long and 22mm diameter. 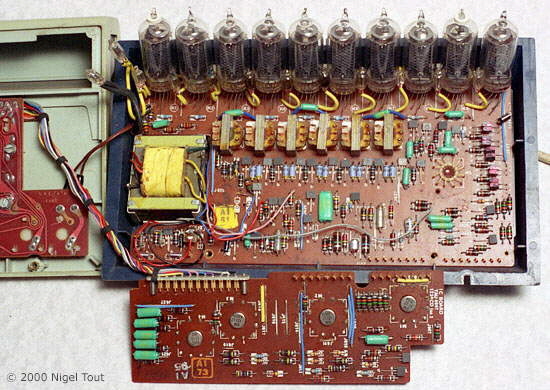 In the above example of an ANITA 1011B LSI the NiCad cells have been removed at some time and have been replaced by the red capacitor (1500 μF, 25VDC) on the left which means that the machine can be operated on AC only. With the cover removed showing the display and circuit boards of the ANITA 1011B LSI. Inside an ANITA 1011LSI. showing the upper and lower circuit boards. 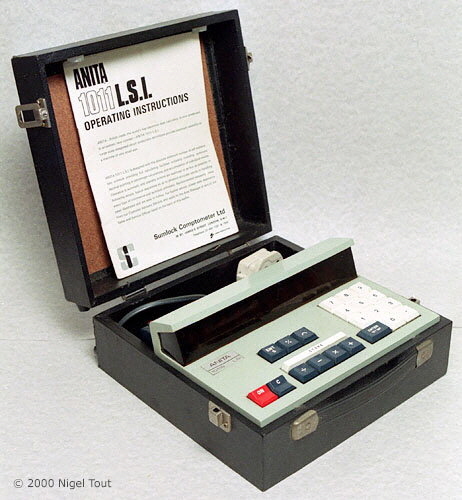 Anita 1011B LSI in its fitted carrying case. The general usefulness of ANITA is now extended with the introduction of the Battery/Mains models. These models can be used with or without mains current supply, so making them truly portable. They have the battery and charging unit built in so as to make entirely self-contained units. All models are fitted with a Mains Connected Light – situated on top of the dark blue section, behind the display, at the left. It illuminates when the machine is connected to a live mains power supply. The Battery Warning Light – symbolised by the letter "B" – is found on the extreme right hand side of the Display. It illuminates only when the battery needs recharging. The battery has a 4/6 hour continuous operation life. To recharge the battery ANITA should be switched to 'Off' and connected to a live mains supply. The battery is only being recharged when the mains connected light is illuminated and, because the machine is switched 'Off', the display is unlit. Battery/Mains models retain the same operating advantages of the mains only models and the same Operating Instructions apply."